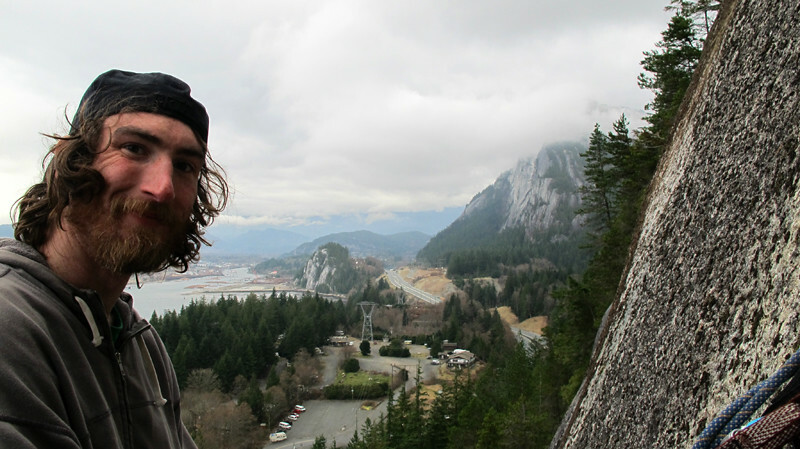 It all started with a post by Kris Wild on my thread “Squamish photos and stories” about his new scrub, Hanging Gardens. Back to Hanging Gardens. I finished it today and installed the anchors. All the fixed lines are down and it's ready for your enjoyment. Remember if you're looking at the McLane guide, the route is reversed with it's neighbor Overhanging Gardens. The first pitch is completely new. It just looked a lot better and more direct than the original start which diagonaled in from 30m to the right. It's very easy to find. As you walk across the base of the Papoose, It's the first clean line you get to on the left. The detritus of route excavation will be quite visible on the ground. The route is comprised of predominantly 5.8 to 5.9 crack climbing, interspersed with short, technical face climbing cruxes. To decend, either walk into the forest on the left and down the trail, or do three raps with a single 60m rope. There are slings/cords on the anchors right now. They'll be replaced with chains next week sometime. So Luke decided he wanted the SFA. He posted the next morning looking for a partner and then called me and Kyle. He said it was nice but the weather was moving in fast, so we had better get down there. I called Kyle and he said he had some chores to take care of first, but he would try and be quick about it. I met him in the village and we headed to Squamish to pick up Luke. We cruised up the new trail, which is pretty nice compared to the old one. After about 10 minutes we encountered the large dirt pile Kris talks about. 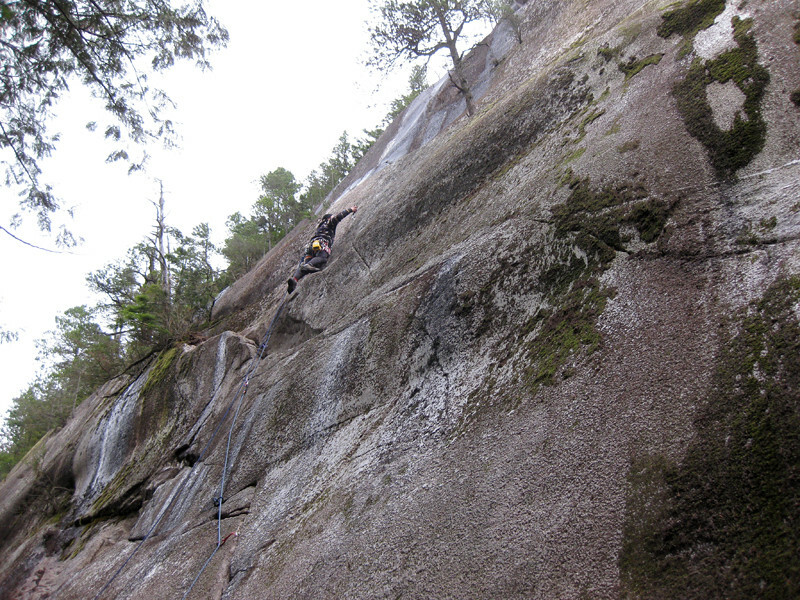 The route indeed was somewhat wet, but didn’t look totally unmanageable and the upper pitches looked quite dry. 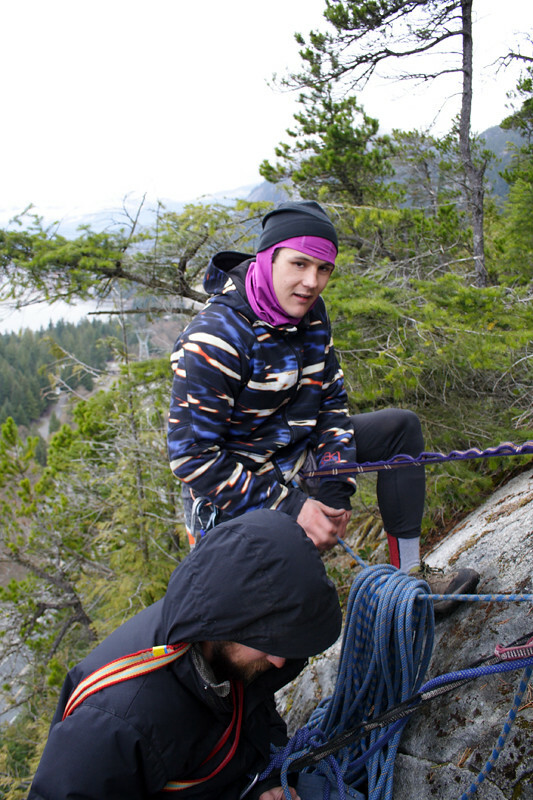 Luke: With consistence and persistence I managed to lure Mike and Kyle down to climb with me. 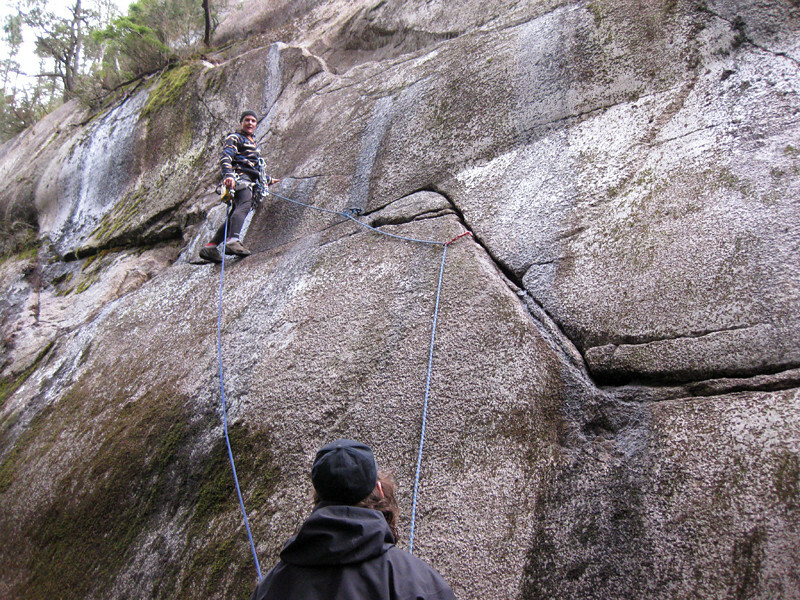 I suggested we hit the recently cleaned Hanging Gardens as to nab the 2nd free ascent. SEVERAL hours later they arrived to pick me up, it was raining quite a bit so I ran back in the house to grab my etriers and hooks. When we arrived and the base off the Papoose, it seemed as though Kyle thought we were just "takin the gear for a walk" and didn't want his cams to get dirty. I told him they don't stay new for ever and racked up. 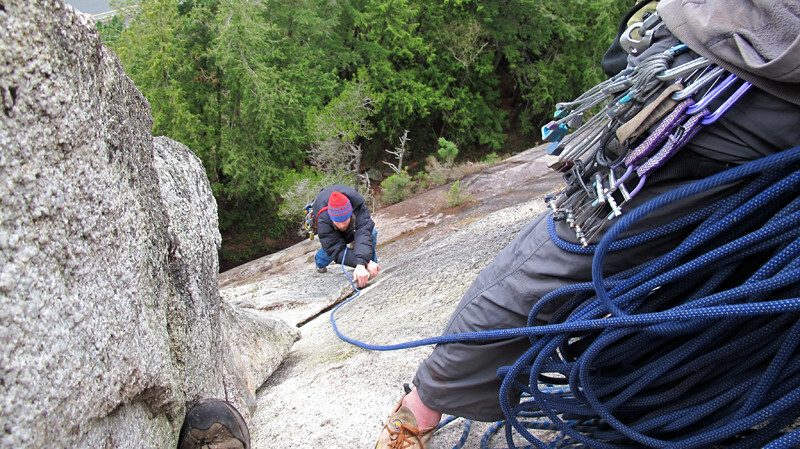 Luke wanted the first pitch so he racked up and I belayed while Kyle took photos. 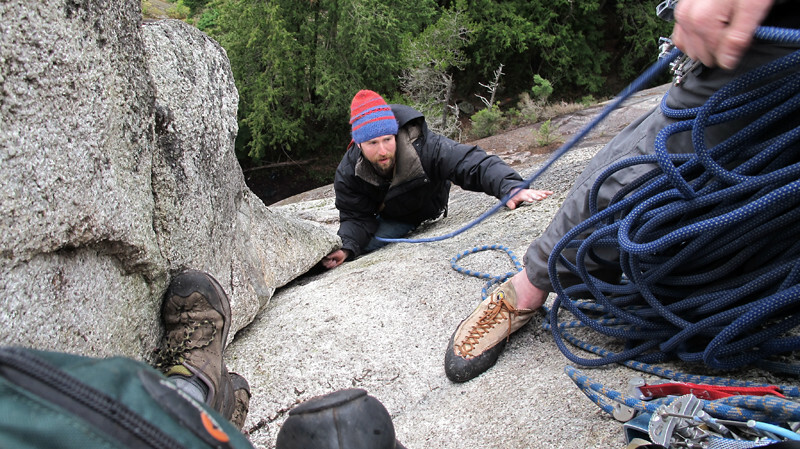 He found the lower traverse fairly easy in his Camp 4’s but once he got to the bolt he called for his rock shoes on the tag line. He tried the move a bit then called for the etrier. “There goes the Second Free Ascent” I said! 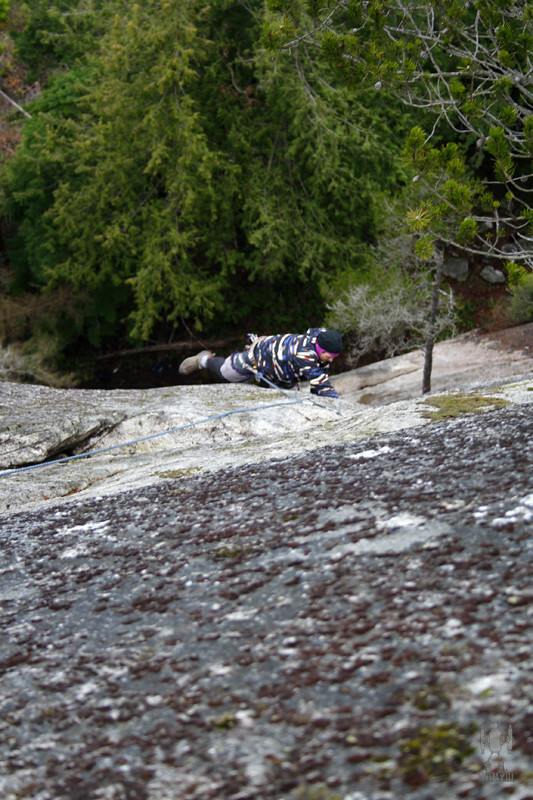 The move to get to the anchor was a bit moist so Luke ended up crossing a wet, mossy ledge to get there. 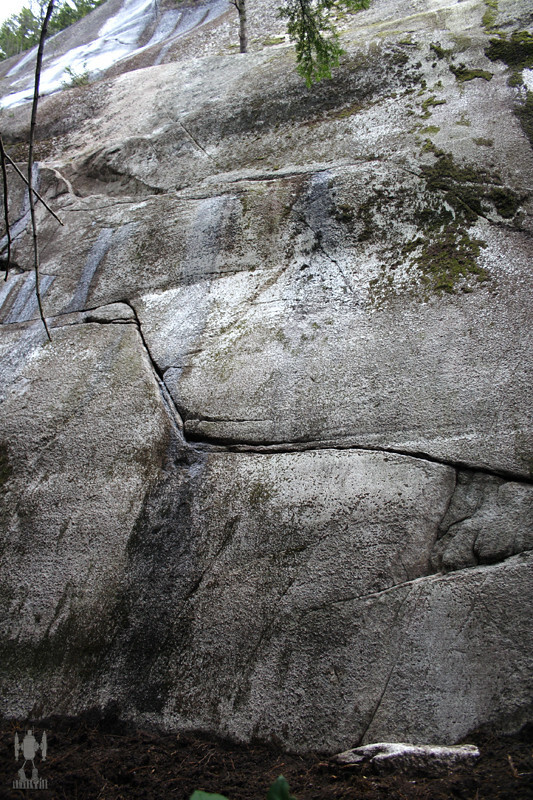 Luke: I started up the easy, but wet cracks to a short bolt protected 5.10 slab section. 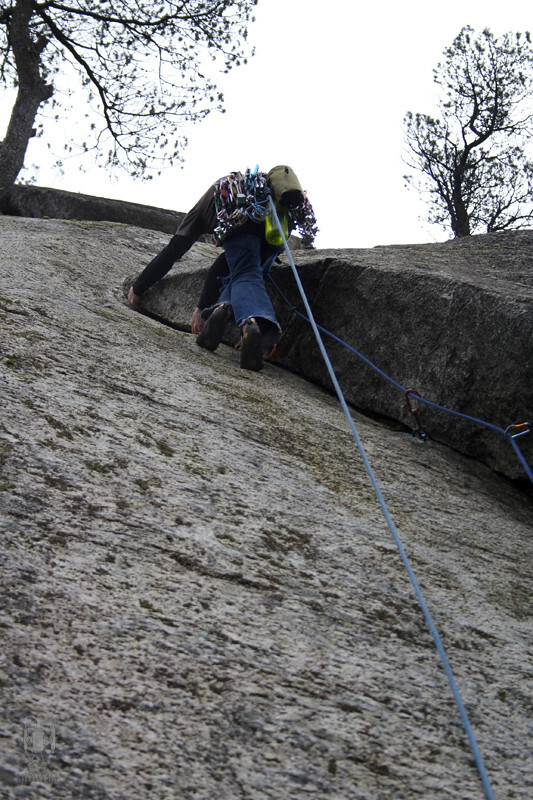 After a couple failed attempts at free climbing though the moistness, I hauled up an etrier and top-stepped past the crux then meandered my way up the anchors. I tried the move at the bolt several different ways but it was too moist and I couldn’t get any friction so I used the etrier. 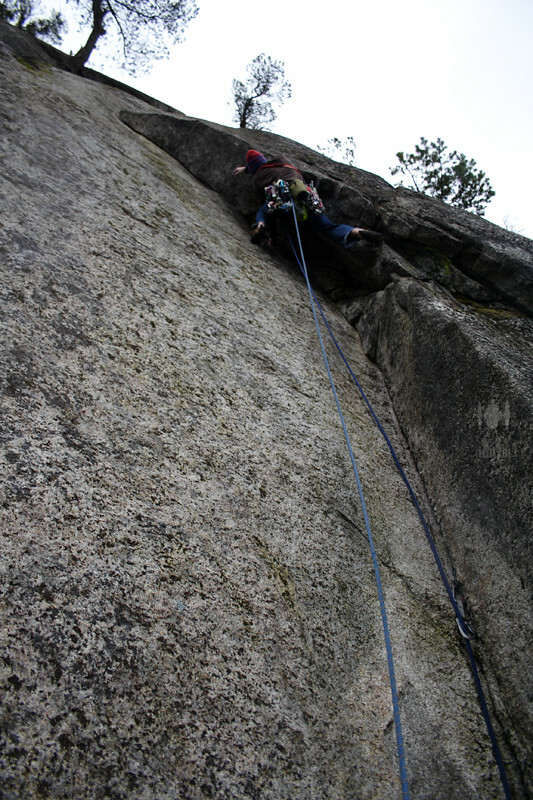 When I got to the belay Luke asked me if I was going to lead the next pitch. “Let me look at it.” As soon as I looked up I started grabbing gear and Luke asked if I’d brought the Grigri. 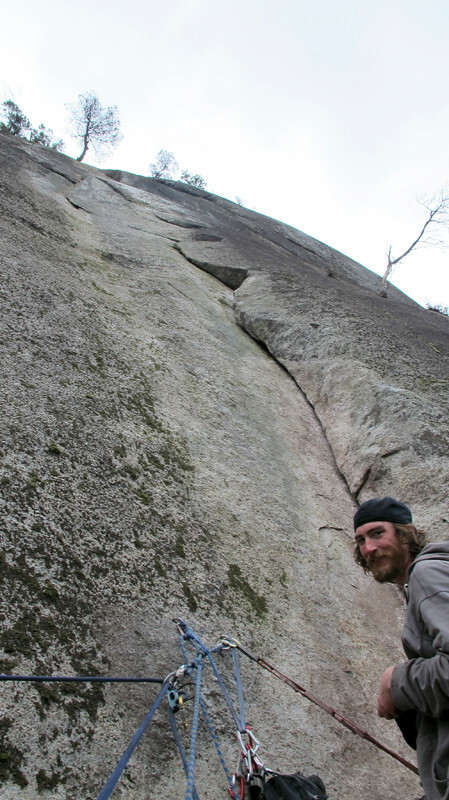 I said yes, and he proposed that I climb the next pitch while he auto-belayed Kyle. I agreed and started up the pitch. It was excellent jamming for my largish mitts and I felt pretty secure on it. When I got to the bolt I tried the move a bunch but Luke kept yelling at me to aid it, so I grabbed the draw and bypassed the crux. (Going back for sure!) 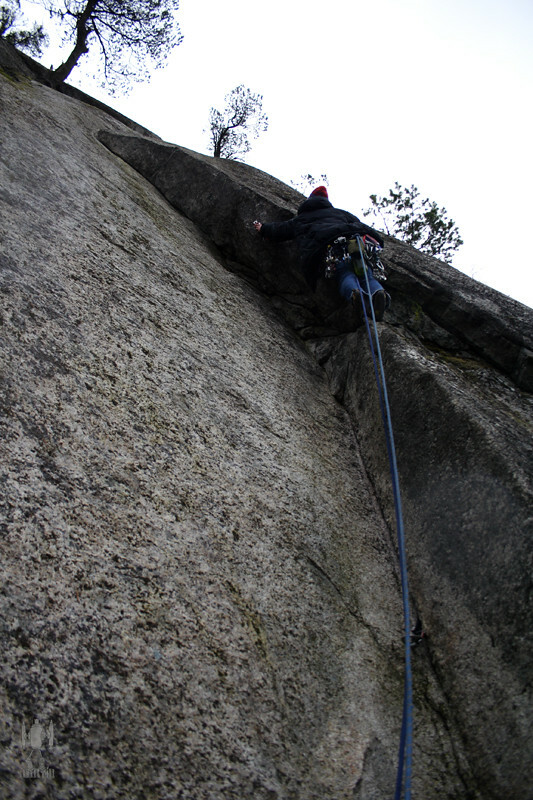 The last bit was pretty mellow and I arrived at the belay quickly. Luke: Mike danced up the easy corner until another bolt-protected wet slab crux… This one was a traverse move over to another crack system. He contemplated the moves while I encouraged him to aid past it instead of wasting valuable rubber slipping and sliding on the wet slab. 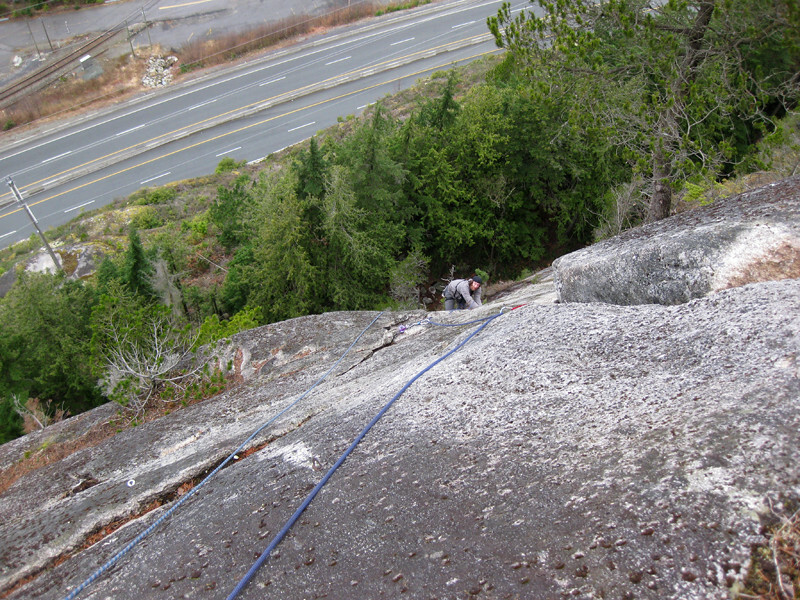 Me: I was able to belay both guys at the same time on my guide, so I brought Luke up a bit first and then started belaying Kyle’s rope. Luke followed cleanly in his approach shoes, but also frenched the bolt. Kyle styled most of the pitch but was confounded at the bolt like the rest of us. 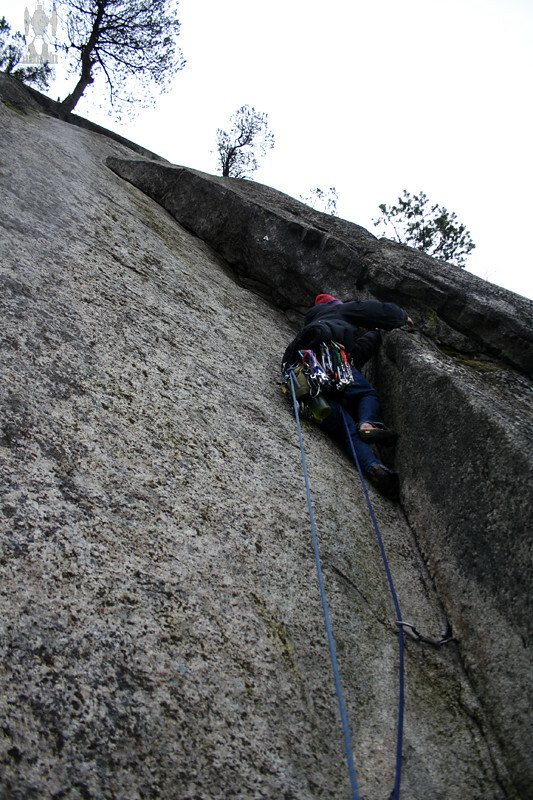 I managed to do a half decent job of stacking the rope but we still had to flake it again for the next pitch. When Kyle arrived I asked him if he was going to lead the next pitch and he gave me the same reply I gave Luke before. Once he looked at it, he was excited. 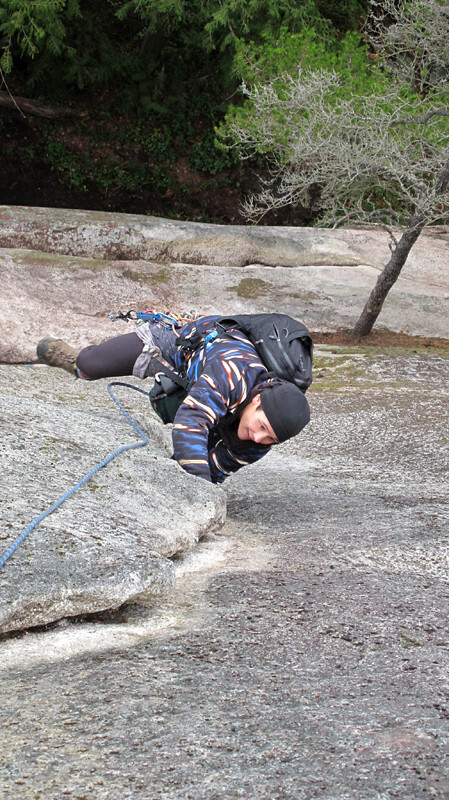 Luke: The next crack system goes up some rattle finger locks in a shallow corner up a ways to the belay. 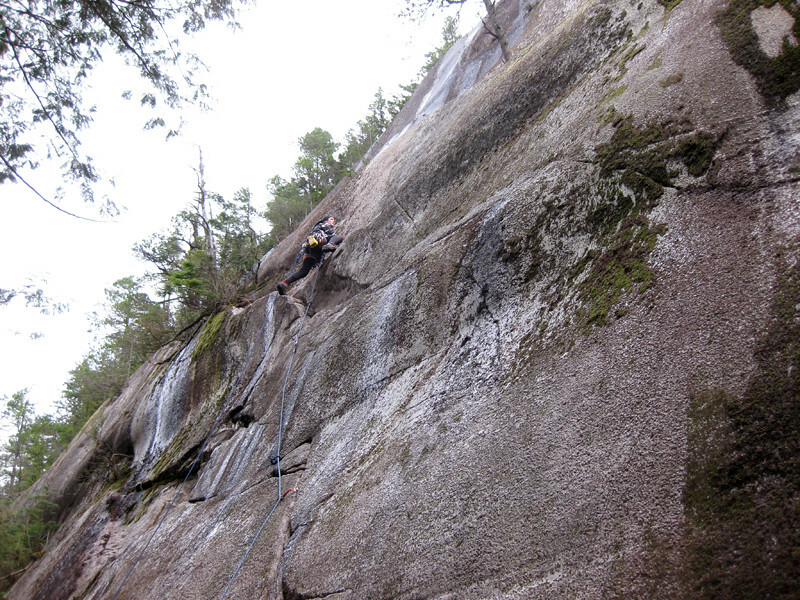 By the time we all got to the second belay both Mike and Kyle were considerably more stoked and optimistic about being on the rock despite the mild drizzle. We got the two ropes nicely flaked and started up the finicky groove into the awkward-looking bolt protected, slanted corner. Once he got a decent piece in the groove he headed for the bolt; which was perfectly placed for him to clip. He had a bit of trouble at the bolt, and almost came off but managed to hold on. 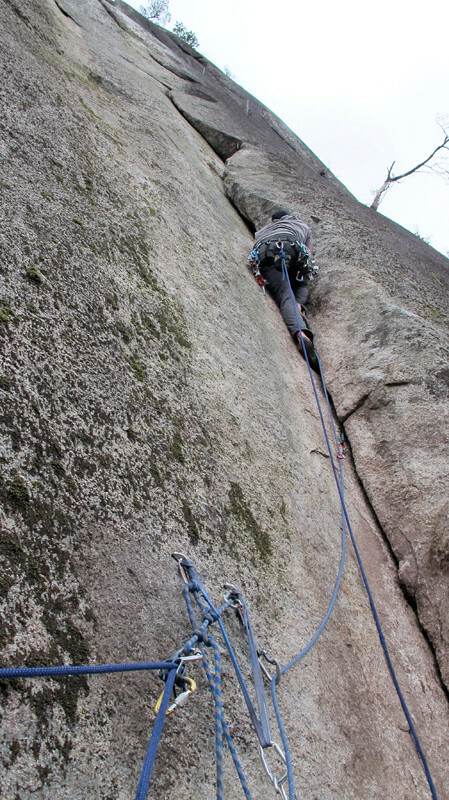 Sweet undercling moves after the crux. I followed cleanly, found it awkward at the bolt as well, but fun. I clipped Luke’s rope on the way up. Luke: Kyle managed his way through without too much trouble and proceeded to finish the pitch. Mike followed the awkwardness without much difficulty. 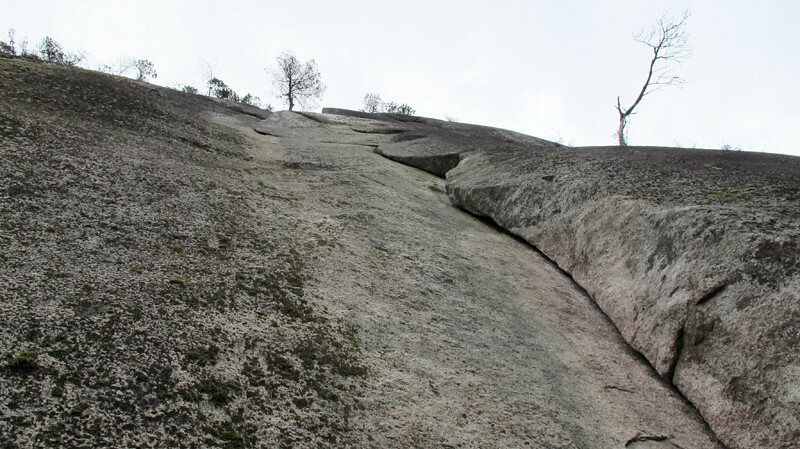 I, on the other hand, got sideways in there for some reason with my back to the rock and my feet pushing ungracefully on the arête, the slanting corner tried its best to spit me out, but I fought gravity with my grovel skills and before ya know it I was at the top. Me: We had to do an extra pitch because Kyle stopped at a tree rather than going straight up to the bolts, so after Luke led and Kyle followed, I tied in short to my rope and joined the boys. We celebrated safety style at the top and then rapped twice with two ropes. This is a super fun route! Go send it! 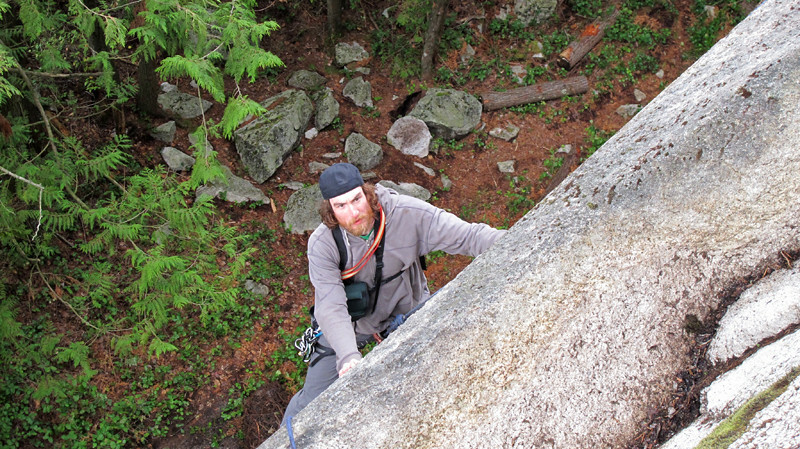 Big Mike is a trad climber from BC, who needs to work on his chimney skills after today's thrashing. Way to make thebest of a rainy day! Thanks guys! It ended up being a really fun day! That traversing first pitch looks like what we used to call (I think) "Hairpin." Hand traverse left with your feet skidding around on glacier polish? Has it been renamed? Combined with Hanging Gardens? It does look like a good time! Thanks Tami! Maybe I'll still look 24 when I'm 35 :D, I'm in no rush to get old, In fact I might just stay a kid for ever. done under the guise of 'graffiti removal'? Ghost- It is not Hairpin but far to the left. I have climbed Hairpin and it is quite fun. Reilly- If Kris power washed that I have no idea where he would have pumped the water from. Pretty sure it's just good old fashioned scrubbing at work. KW does it up right!